When you discover Bayonne Ham, its appetising smell of hazelnuts will make your mouth water. To taste it, nothing could be simpler! Clamp the Bayonne Ham firmly in a stand so that the thick, heavy, rounded part (chistera) is held securely, allowing you to work first on the thinner, flatter part, the petite noix, from the top. Take a small serrated knife and use it to remove some of the rind, working with the grain of the meat, along the muscle. Uncover but do not remove the fat, as you take the rind away from the area where you will be slicing the ham: you will also need to take some rind off the sloping side of the ham. Only remove as much rind as you need to reach the ham you wish to slice immediately, since the remaining rind will stop the ham from drying out too fast once it has been cut for the first time. Take a large ham knife, with a long, thin and flexible blade and slice along the top surface of the ham as thinly as possible, taking shavings of ham with a band of fat still attached. There is no need to worry if you do not finish your Bayonne Ham straight away: it can be stored somewhere cool and dry, but not in a refrigerator! It just needs to be covered with a cotton cloth, like a tea towel or better, a woven ham bag that will let cool air circulate around the ham but prevent insects from damaging it. When you would like some more, set aside the first slice, which will have dried somewhat. The flavour and texture of subsequent slices of Bayonne Ham will not have changed. 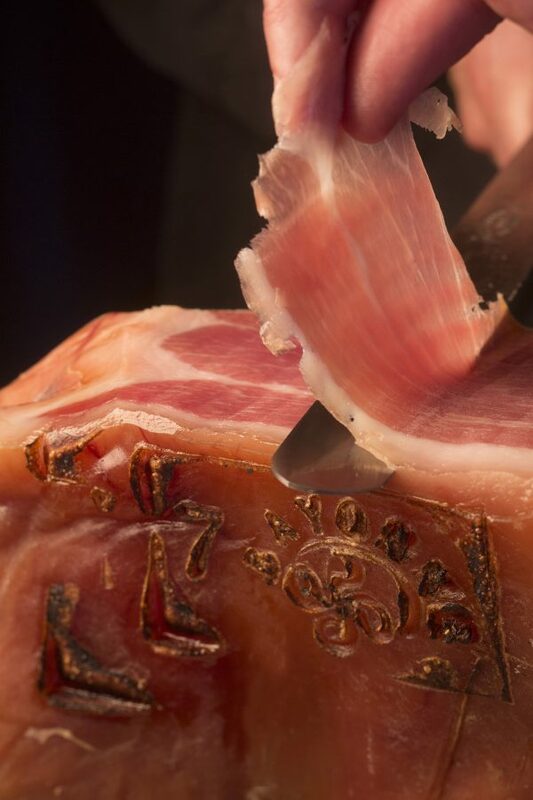 Take the time to savour your Bayonne Ham. It may well bring back childhood memories of past meals. The Adour river basin is the birthplace of the unrivalled Bayonne Ham, which brings with it the scent of hazelnuts and chestnuts from its heartland, between the ocean and the mountains.